Classic Baja Buggy - Steve McQueen's "BAJA BOOT"
The Baja Boot was one of the defining vehicles of the Baja 1000. Built in 1967 by Vic Hickey, an engineer at General Motors, it was revolutionary and an impressive sight. The chassis was constructed out of SAE- 1010 13/4-inch steel tubing that weighed 3,450 pounds. It was powered by a 350 that was installed backwards and in the rear of the vehicle. It had independent suspension, 4-wheel drive, and could operate from a front wheel drive platform through an inverted drive assembly that allowed the driver to disengage the transfer case. 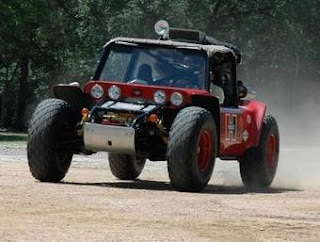 McQueen raced the Baja Boot in 1969’s ‘Baja 1000′, the Baja 1000 was the longest off road race in the world. It is also arguably the toughest and most dangerous– 1969’s event claiming two lives. With just 237 miles completed, disaster struck when a broken transmission put them out of the race. Up to this point in the race they had been traveling well and McQueen later said “In the fast sections, it was not unusual for us to get airborne for 50 to 70 feet over road dips. The Boot rides so smooth you can overdo things. Even in bad, choppy sections it’ll do 60 or so, and if you slam into a big rock at that speed you can crack an axle or worse.” The original and first built Baja Boot is currently up for sale. I have no idea what kind of price, but what a sweet ride! Over 40 years old and it still demands a look or two! Wish I can drive that everywhere. I would love to get my hands on that beauty. That Buggy was designed really good. It's interior is really great too the gauge, suspension, and its exterior design. Very good invention. PLEASE RENEW, REUSE, AND RECYCLE! Buy and install a CFL. Turn off the A/C and sweat it out, you probably need to lose some weight anyway. Drive less. Think about what you are tossing in the garbage can at home, at work and when you are out and about.